Our Pocket room divider is practical and fun for home or office - organize correspondence, bills, recipes, cooking utensils, tools, fasteners - anything! Panel frames are crafted from durable, lightweight Scandinavian Spruce, using mortise & tenon joinery. Shade is off white cotton canvas suspended on 3 wood rods at the top, middle and bottom of each panel. Rods are removable and the canvas is washable. Pockets measure approx. 7 ¾" tall x 5 ¾" wide, on the front only. 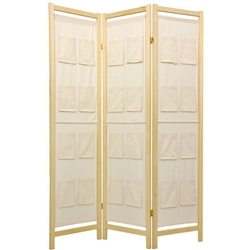 Available in Natural finish only, in 3, 4, 5, or 6 panel sizes. Each panel measures approx. 72" tall x 17 ½" wide x ¾" thick. 3 panel screen measures approx. 53" wide flat, approx. 45" wide folded to stand upright (as shown).